NEW ORLEANS – The Tulane baseball incoming class for the 2017-18 year has been finalized, as announced Thursday by head coach Travis Jewett. The Green Wave newcomer class includes 15 incoming freshmen and nine transfers. Among the transfers, six either began at or moved from four-year schools. The newcomers represent 13 states and British Columbia, including five student-athletes from the state of Louisiana. "Please join me in welcoming our recruiting class for the 2017-18 season," Jewett said. "We are very excited to add these high quality young men to our baseball program here at Tulane. With the loss of so many great and experienced players from last year's team, we certainly feel like this group has a chance to step in and have an immediate impact. The combination of pitching and position players from high school and transfers alike, is what we were looking for to fill our specific needs. I want to give a special thanks to Tighe (Dickinson) and Billy (Jones) for their hard work and dedication as it pertains to the procurement of this group. I am excited to see our returners and newcomers together here soon, and to begin what we hope is a great year." Josh Bates is a 6'2" right-handed pitcher from Orlando, Fla. He was a three-year letterwinner at Bishop Moore Catholic High School, where he went 9-1 with a 1.21 ERA and 112 strikeouts in 70 innings as a senior last season. He struck out 16 batters in a game last year, and tossed back-to-back no-hitters during his junior season. David Bedgood is a 6'0" infielder from Sherman High School in Sherman, Texas. He was a four-time All-District 5-5A selection, and the district MVP as a senior. He hit .410 with five home runs, 30 RBI, 36 runs and a .520 on-base percentage last year. A two-sport athlete, he also earned all-district football honors at quarterback. Justin Campbell, a Troy, Mich., native, is a 6'6" freshman left-handed pitcher from Bishop Foley Catholic High School. He went 11-1 with a 0.60 ERA and 102 strikeouts in 81 innings, and also hit .432 at the plate. A three-time All-Catholic High School League selection, he pitched a complete-game shutout in the state title game. He also lettered two years in basketball. Brendan Cellucci, a 6'4" left-handed pitcher, hails from William Penn Charter School in Wyncote, Pa. He was a two-time first-team Inter-Academic League selection by the Philadelphia Inquirer. He was also named his team's most valuable player in 2016. He also competed in swimming and diving. Andrew Gorham is a 6'4" outfielder from Westford, Mass. He hit .506 with 24 RBI and 13 extra base hits as a senior at Cheshire Academy, earning first-team Central New England Prep School Baseball League honors. He spent his first three years at Tabor Academy where he earned three letters in baseball and three letters as a tight end/defensive end in football. Ryan Green, a 6'6" right-handed pitcher from Rochester, N.Y., is a junior transfer from Niagara County Community College. He went 6-3 with a 3.05 ERA and 42 strikeouts in 38.1 innings across 12 appearances at seven starts last season. He lettered two years in baseball and two years in volleyball at Penfield High School. He will have two years of eligibility remaining. Trevor Jensen, a 6'2" infielder from Dunedin, Fla., is a junior transfer from St. Petersburg College, where he hit .374 with 51 RBI, five homers, 16 doubles, 54 runs and 74 hits last season. As a senior at Dunedin High School, he earned all-state honors after hitting .479 with 35 runs, 25 RBI and 11 stolen bases. He will have two years of eligibility remaining. Trent Johnson is a 6'5" right-handed pitcher from Metamora, Ill., who spent one year at John A. Logan College after a season at the University of Arizona. The redshirt sophomore went 11-2 with a 2.07 ERA and 80 strikeouts in 69.2 innings last season at Logan College. The Metamora High School product was a two-time all-state selection as a first baseman, and hit .392 with 10 homers, 18 doubles and 48 RBI as a high school senior. He will have three years of eligibility remaining. Ty Johnson is a catcher/outfielder from Anacortes, Wash. The 6'3" junior transfer comes to Tulane from Central Arizona College, where he hit .352 with seven extra base hits, 18 RBI and a .413 on-base percentage in 43 games. He lettered four years in baseball and basketball at Anacortes High School, where he hit .417 as a senior, and was a two-time first-team All-Northwest Athletic Conference selection in baseball. Johnson, who began his career at Washington State University, will have two years of eligibility remaining. Chris Koppenhaver is a 6'2" right-handed pitcher from Davie, Fla., A redshirt junior transfer from Broward College, he pitched in 21 games, with 19 relief appearances over 33.2 innings, and recorded an 8.29 strikeout per nine inning rate. As a senior at Pine Crest High School, he totaled 40 strikeouts in 24 innings as a closer his senior season, when he was named a Perfect Game Second-Team All-America selection. Koppenhaver began his college career at Duke University, and will have two years of eligibility remaining. Will Mangurian, a 6'2" first baseman from Alpharetta, Ga., is a freshman out of Johns Creek High School. He hit .310 with 32 RBI, a .442 on-base percentage and three home runs last season. He was award his team's gold glove award as a senior, after committing just two errors in four years at first base. Will McAffer is a 6'3" right-handed pitcher from North Vancouver, British Columbia, Canada. The junior transfer comes to Tulane from Central Arizona College, where he went 6-3 in 16 games with 13 starts, totaling 62.1 innings. As a senior at Sentinel Secondary School, he put up a 1.36 ERA and struck out 65 batters over 52.1 innings, earning Premier Baseball League Pitcher of the Year honors. A member of the Canada U18 national team, he began his career at the South Dakota State University, and will have two years of eligibility remaining. Frankie Niemann is a 6'0" catcher from Lake Mary Preparatory School in Sanford, Fla. A first-team All-District 2-9A as a senior, he hit .437 with 10 doubles, five home runs and 27 RBI. He was his team's MVP in 2016 and 2017, and earned second-team all-district honors as a junior. Hayden Onorato, a 6'3" left-handed pitcher from Alpharetta, Ga., is a freshman out of Cambridge High School. A three-year letterwinner in baseball, he was named his team's defensive MVP as a junior. As a senior, he went 5-1 with a 0.78 ERA, and set the Cambridge school record with a 0.47 opponent batting average. Acy Owen is a 6'3" catcher from Brandon, Miss. The junior transfer attended Hinds Community College after graduation from Northwest Rankin High School. Last season at Hinds, he hit .337 with 15 RBI, six extra base hits and a .467 on-base percentage. As a high school senior, he batted .448 with a .593 OBP, earning first-team all-state honors. Owen, who also earned two letters in bowling, will have two years of eligibility remaining. Sam Peacoċk, a 6'0" right-handed pitcher from Sherman Oaks, Calif., is a freshman out of Harvard-Westlake School. He went 4-0 with a 1.65 ERA in nine appearances and four starts last season. He helped his team to the California Interscholastic Federation Division I Southern Section State Championship in 2016. Connor Pellerin, a Baton Rouge, La., native, is a 6'4" right-handed pitcher from Episcopal High School. He was 9-3 with a 0.97 ERA and 108 strikeouts against just 32 walks, earning first-team Louisiana all-state honors. He was the district Most Valuable Player, and led his team to the district title and quarterfinals of the state playoffs. He also lettered four years in football. Alston Pough is a 6'2" freshman right-handed pitcher from Paramus, N.J., who attended IMG Academy in Florida. He was a four-year letterwinner in baseball. He was a 2017 Perfect Game Northeast Region Honorable Mention and a 2016 Perfect Game Underclass Honorable Mention All-America selection. Jake Revere is a 6'0" freshman catcher out of Friendswood High School in Friendswood, Texas. He hit .280 with a .333 on-base percentage, and was named a VYPE magazine playmaker and a top defensive catcher in Texas, and a Rawlings/Perfect Game All-Region selection. Kaleb Roper, a Kenner, La., native, is a 6'2" right-handed pitcher who came to Tulane from San Jacinto College in Texas after beginning his collegiate career at the University of Arizona. The Archbishop Rummel product posted a 9-4 record and a 2.41 ERA with 116 strikeouts in 86 innings last season, earning all-region honors. He earned regional all-tournament team honors and led the Gators to an NJCAA runner-up finish. He will be a redshirt junior and have two years of eligibility remaining. Stephen Sepcich, a Mandeville, La., native and Jesuit High School product, is a 6'2" freshman outfielder. He hit .364 with 26 RBI, 33 runs, five home runs, 12 doubles, a .636 slugging percentage and a .445 on-base percentage as a senior. He is the 10th-ranked player in the Louisiana Class of 2017 by Perfect Game, a 2016 Prep Baseball Report all-state honoree, and was selected to the Louisiana High School Coaches Association 2017 All-Star Team. Michael Slatten is a New Orleans native who attended Isadore Newman School. The 6'2" freshman first baseman hit .436 with nine doubles, three triples and 28 RBI at the plate, and posted a 1.94 ERA with a .167 opponent batting average in 52.2 innings on the mound as a senior. He hit for the cycle on senior night, and was named his team's defensive MVP last season. Marc Theberge, a native of Destrehan, La., who attended Jesuit High School, is a 5'9" freshman infielder. He hit .344 with team-highs of 23 RBI, five triples and 28 walks as a senior. He also compiled a .529 on-base percentage and a .533 slugging percentage, and put together a nine-game hitting streak last year. Ben White is a 6'3" right-handed pitcher from Holden, Mass. He is a graduate transfer from the College of the Holy Cross, and will pursue a graduate degree in homeland security from Tulane. The St. John's High School product posted a career 4.10 ERA with 135 strikeouts in 147.2 innings at Holy Cross. Last season, he totaled 25 strikeouts in 20.1 innings across nine appearances and five starts. He has one year of eligibility remaining. Tulane will hold fall practice beginning Oct. 6. Follow Green Wave Baseball on Twitter, Facebook and Instagram. 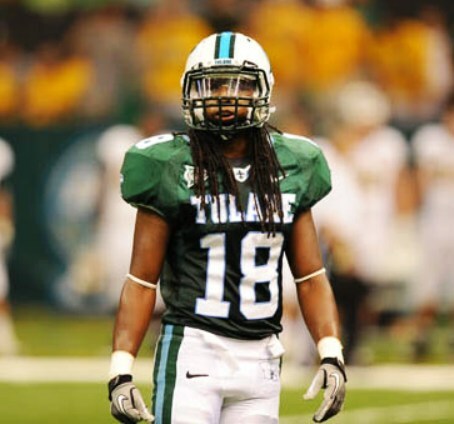 Follow Tulane Athletics on Twitter, Facebook and Instagram. Damn auto-censor. Gonna fix that. Looks like appetite good class on paper. The thing that sticks out the most are the heights. A lot of tall pitchers and fielders in the group. I'm interested in seeing Roper pitch, and it's not just because he's part of the Catholic League Mafia Aside from being a Raider, at one time San Jacinto was considered one of the top JuCo programs and may still be one of the better ones today. San Jac is still a power. Located in the Houston area, they have had teams that could have won the Big 12. When my oldest son was playing, they scrimmaged San Jac in the fall. They pulled into the stadium parking lot with two buses - they had 65 kids on their fall roster. Just an unreal site. I hope he turns pro now. No worries, Tulane will get the Jesuit guys. Not worried. We've got 25+ players coming in this year and 15 already for next year. LSU has 20 every year. 5'10" 1B and DH aren't worth the money unless last name country. Rather spend it on pitching. Obviously Jewett and Mainieri disagree with your assessment that he's not worth the money. I'm not worried. Actually its a breath of fresh air, we don't have to sink that much money into a 1B/DH. Only reason manieri wanted him was because so we didnt get him. He hasnt had a lot of success against us much recently on the field. They get tons of top talent every year. They also have more players transfer out of their then any team in the county due to only 8 position players getting to play and usually half of them are returning starters so only 3-4 positions are open each year...if that many. Manieri also wanted france, merrill, alemais, rogers, montalbano, massey, oakley and didnt get them. Quite a spin to turn losing arguably our best commit in the class into a positive. You don't even know what we offered him to justify that this a good thing because he'd be taking up too much scholarship money, but you're playing that card anyway. Very interesting. More BS with the "Mainieri only wanted him so we didn't get him". You're really just making things up now. And I doubt Mainieri cares at all about losing a few games to Tulane. He's in a SR every year and the CWS every other year. Agree, these are all very dumb points. i dont know what he was offered at tulane and i dont care because i'm not worried we lost him. By the way, he's the second lowest rated recruit LSU has for his class. I wish the kid well, i have no hard feelings and hope he gets drafted high!! don't get mad at me because i'm not panicking like most on here screaming desperation over a 1B. Wasn't he the highest rated recruit for our class? He was at one point, maybe things have changed. If so, it doesn't bode well for us. Literally nobody is panicking and nobody is mad at you. I'm just pointing out that your argument for why you aren't worried about it is very flawed and stupid. Did anyone consider he's just a really big fan of the lazy river? Our LHP from PA. is no longer on the Roster any info ? He's talking about Brendan Cellucci. He's not on the roster any longer. When does Fall Ball start? Tulane new baseball commitment Landon Boeneke CHS Baton Rouge, RHP, 3b & 1b 6'6 205 saw on twitter from his coach.